During inflammation and infection, bone marrow stem cells that make blood cells (so-called hematopoietic stem cells or HSCs) and progenitor cells are stimulated to proliferate and differentiate into mature immune cells. This especially the case for cells of the so-called “myeloid lineage. Hematopoietic Stem Cells (HSCs) are able to differentiate into cells of two primary lineages, lymphoid and myeloid. 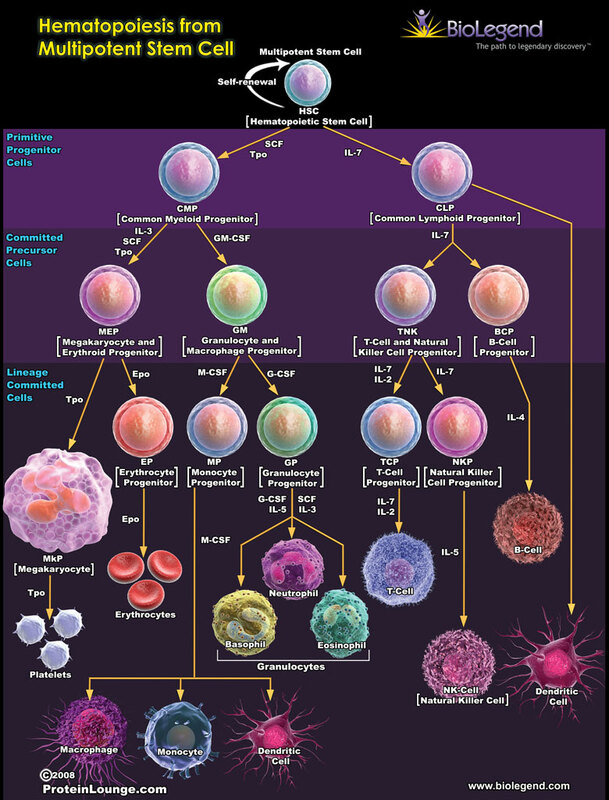 Cells of the myeloid lineage develop during the process of myelopoiesis and include Granulocytes, Monocytes, Megakaryocytes, and Dendritic Cells. Circulating Erythrocytes and Platelets also develop from myeloid progenitor cells. Repeated infections and inflammation can deplete these cell populations, which leads to serious blood conditions and increased incidence of cancer. A research team from the California Institute of Technology, led by Nobel Prize winner, David Baltimore, has discovered a small RNA molecule called microRNA-146a (miR-146a) that acts as a safety valve to protect HSCs during chronic inflammation. These findings also suggest that deficiencies for miR-146a might contribute to blood cancers and bone marrow failure. Baltimore and his colleagues bred mice that lacked miR146a. MicroRNAs are very short RNA molecules (around 22 base pairs long) that regulate the activities of other genes. They control the expression of genes at the transcriptional and post-transcriptional level. In the case of miR146a(-) mice, whenever these mice were subjected to chronic inflammation, the total number and quality of their HSCs declined steadily. In contrast, miR-146a(+) mice were better able to maintain their levels of HSCs despite long-term inflammation. Zhao also noted the surprising result that the deletion of one microRNA could cause such a profound and dramatic pathology. This underscores the critical and indispensable function of miR-146a in protecting the quality and longevity of HSCs. This work also establishes the connection between chronic inflammation and bone marrow failure and diseases of the blood. Even more exciting is the prospect of synthesizing anti-inflammatory drugs that could treat blood disorders. In fact, it is possible that artificially synthesized miR146a might be an effective treatment if small RNAs can be effectively delivered to specific cells. Zhao also noted the close resemblance that this mouse model has to the blood disorder human myelodysplastic syndrome or MDS. MDS is a form of pre-leukemia that causes severe anemia and a dependence on blood transfusions. MDS usually leads to acute myeloid leukemia. Further study of Zhao and Baltimore’s miR146a(-) mouse might lead to a better understanding of MDS and potential new treatments for MDS. See Jimmy L Zhao, Dinesh S Rao, Ryan M O’Connell, Yvette Garcia-Flores, David Baltimore. MicroRNA-146a acts as a guardian of the quality and longevity of hematopoietic stem cells in mice. DOI: http://dx.doi.org/10.7554/eLife.00537Published May 21, 2013. Cite as eLife 2013;2:e00537. Postscript: This paper is especially meaningful to me because my mother died of MDS. The fact that a better model system for MDS has been established is an essential first step in finding a treatment for this killer disease.